In my honest opinion, the Grumman F-14 Tomcat was the most beautiful aircraft ever made. It’s was a twin engine, twin tail, variable sweep wing fighter aircraft, for two (the Pilot and his EO- Electronics Officer or RIO – Radar Intelligence Officer) and a creative masterpiece. The variable geometry wings (sweep wings) added drag by providing the extra wing surface needed for take offs and landings. 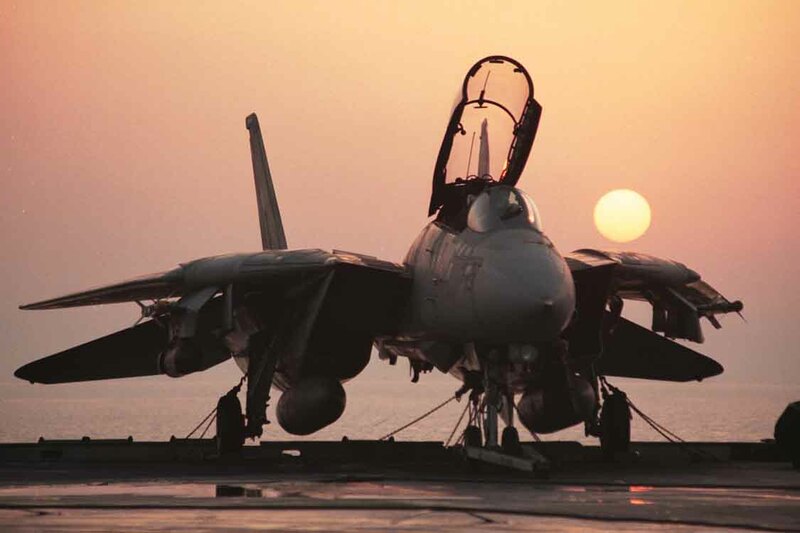 When the wings were swept back the F14 Tomcat was a thinner vehicle and better able to reach supersonic speeds. Some say in swept wing mode the Tomcat could reach over Mach 2 with its twin Pratt and Whitney engines. Grumman won the contract to produce the F-14 in 1969. It was continually modified over the years since then for different missions. It was eventually retired in 2006. My dad was in the NAVY way back when. That’s when I fell in love with the aircraft. My mom and I would go on base to pick my dad up and we would pull up near a hangar. These planes were around and caught the eye of the Hernandiesel. It’s profile and silouette were awe inspiring to me. Then came the Top Gun movie in 1986. In it, Tom Cruise’s character, Pete Mitchell, piloted one of these machines. The scenes of this plane in action sealed the deal. I was one struck puppy. This entry was posted in Fascinating to The Hernandiesel and tagged Aircraft, F-14, F14, Fighter aircraft, Grumman, Grumman F-14 Tomcat, NAVY, Tom Cruise, Tomcat, Top Gun, Variable-sweep wing by hernandiesel. Bookmark the permalink. While there is no doubt that the F-14 is an increidble flying machine, in my opinion, it lacks the fluid grace of the F-106A. The Delta Dart is somehow just “right,” when it comes to the beauty of its design. The F-106 didn’t even have missiles hanging under its wings. This aircraft used an internal missile bay to house the Falcon missiles that it fired.